…and hundreds more animals to draw! And Start Drawing Animals Like this! Not only will you discover exactly how to draw over 200 animals, you’ll be surprised to discover that each animal only takes 6 to 8 steps to draw and less than 15 minutes to master. I use this whole series in my Art Class to Elementary children. They love this extra activity. It builds their confidence that they can draw identifiable things. They even take multiple instructions and create a whole picture. These books on how to draw are very easy for kids and beginning artists to follow. This is a fun drawing guide for kids (and adults, too) that shows, step-by-step, how to make simple, stylized outline drawings of 101 animals, everything from armadillos to zebras. It has kept the preschooler and teenager in our household entertained for hours — and it’s the first place I look if I want to figure out how to make a simple line drawing of a horse or panda bear. This is an excellent book for the beginning artist or any artist wanting to improve their skills. The animal anatomy is superb. The cost of the book is also a plus. I got a lot more than I paid for, especially with the bonus books! This is a really exceptional fundamental book which includes the whole range of animals in a really simple and easy to comprehend format. I’ve been looking for a way to get my kids interested in drawing, I ordered the books (200 Animals, Farm Animals and Forest Animals) and pretended like I bought them for myself, my 6 year old son saw me drawing and asked what I was doing “oh, just learning to draw a Shark” he called up his older brother and they asked me if they could try, “sure” they took the book and spent hours drawing that day. …… this book can be the beginning of a great relationship between your child and his pencil doodles. My 6yr old loves to draw but wanted lessons. This was the next best thing, easy to follow steps and now she is happy to draw. There are more animals then I have seen in other how to draw books. Yes! I want to download my copy of How To Draw Animals – Plus The 4 Bonus Books Now! 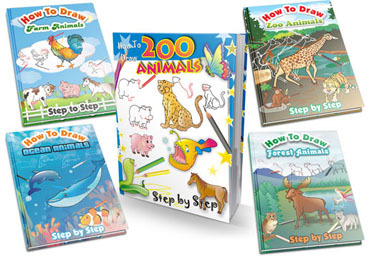 I want to learn how to easily draw over 200 Animals using the step by step lessons in the book! I also get a LifeTime Membership to any new books released in the future. You get everything I outlined, all the features of this How To Draw Course will be instantly downloadable and lets you Start Drawing Animals TODAY! This special low promotional price won’t last forever though so buy now before I decide to increase it back to $47. That’s right! Take 60 days to use and learn from How To Draw 200 Animals. That’s more than 8 weeks to learn how to draw simple Animals step by step! Try the step-by-step techniques yourself and learn how to draw each Animal while dramatically improving your animal drawing skills. I’m confident you’ll enjoy this book so much, you won’t want to give it back! But, if you aren’t satisfied for any reason, or it doesn’t live up to your expectations, you won’t be out one red cent. Just send me an email and I will refund your payment right up to the final day of this 60 day guarantee. No questions asked. Includes access for life to any new book downloads. LifeTime Members – Click Here!